For over 30 years, Always in Mind (AIM), a marketing firm based in Louisiana, has provided large companies such as Exxon-Mobil, Marathon, Monsanto, Valero, BP, Conoco, and many more with promotional products, signage, and safety recognition programs. Companies involved in OSHA’s Voluntary Protection Program (VPP) rely on their employees to maintain a comprehensive safety and health management system, and AIM assists these companies by creating and administering successful safety recognition program. Employees earn points for safety practices and healthy lifestyles to redeem for merchandise. AIM has been using software to keep track of points and allow employees to use their points, but the system was outdated in technology and process and had not been maintained. The Envoc team donned their hardhats and got to work on creating a new software solution for Always in Mind. AIM has offered its safety incentives program Employee Participation (EmPart) to its customers for over 15 years. The program involves tracking safety-related achievements of employees across many companies as well as managing the products employees can choose as reward for their achievements. Before coming to Envoc, this program was implemented with outdated custom software that was complicated to maintain, not well-designed for user experience, and built for outdated technologies. In short, the software would not allow AIM to grow and develop their business model. In order to overcome the old software’s many pitfalls, AIM implemented several tedious and error-prone spreadsheet operations. AIM approached the Envoc team with a list of grievances and our developers were ready to get their hands a little dirty. As with every project at Envoc, we prioritized thoroughly understanding AIM’s business processes through intensive and iterative business discovery. As we learned about the impractical elements of the old program, we created models of the more complicated concepts. 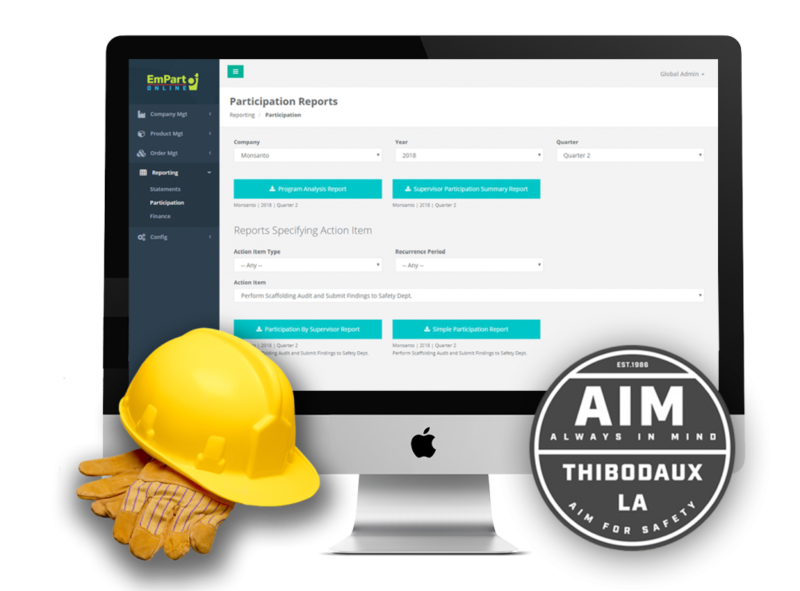 Not only are AIM administrators responsible for updating records for each company’s innumerable employees, they must also maintain each employee’s achievements, as well as tracking products and vendors. By involving ourselves in both the client’s and user’s day-to-day processes, we came to fully understand the complexities of the EmPart program from AIM’s in-house and the client-facing employee perspectives. Our developers worked closely with AIM through every step, which allowed features to evolve and extraneous items to become apparent and omitted. It was important to be mindful of the scope and scale of AIM’s clients to ensure we were building the most useful and comprehensive portals on both sides of the program. While the EmPart portal is fundamentally an accounting system, the intricacies of tracking employee achievement and reward for each individual and unique company required a multifaceted and versatile system with heavy processing power. Our developers created a software solution that not only met all needs, but also added a high degree of usability and scalability. The new EmPart portal records every achievement or reward redemption as a distinct credit or debit, allowing AIM administrators to maintain individual transactions. Even with multiple large-scale companies, all time-sensitive achievement and redemption standards are enforced in real-time. Additionally, the portal allows large amounts of employee information to merge while raising flags to indicate any missing data. Administrators can track employee orders, maintain product stock, and communicate with vendors from one portal. On the client-facing employee side, employees can keep track of their achievements and points. To provide users with an easy-to-use experience, Envoc developers created an e-commerce site that behaves like any other online store. 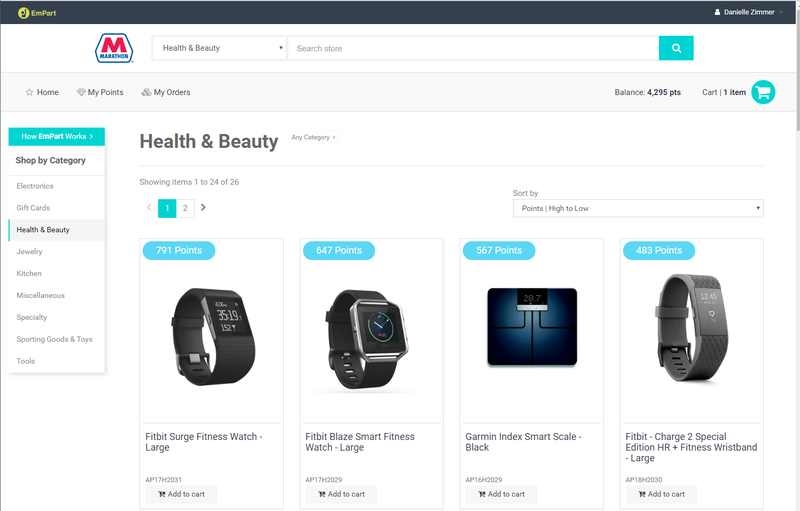 Employees can browse products, add to and edit their cart, and check-out accordingly with their reward balance. With growth and flexibility in mind, our developers created a software to serve dual users with different needs, all while keeping both sides in-sync at all times. The new software streamlines all processes and allows AIM to provide their clients with the best VPP while enabling employees to easily redeem their well-earned rewards. Working with the team at EnVoc was hands down the best collaborative experience I’ve had. From their attention to detail and creative approach to bringing our program online, the whole experience went seamlessly. They took the time to fully understand our needs and exceeded our expectations with the new EmPart software. I look forward to continuing our partnership and working on future projects together.